WASHINGTON (Army News Service, Nov. 30, 2011) -- The Army's chief of staff took time Nov. 29 to thank some civilians who have spent their own time looking out for Soldiers and their families. 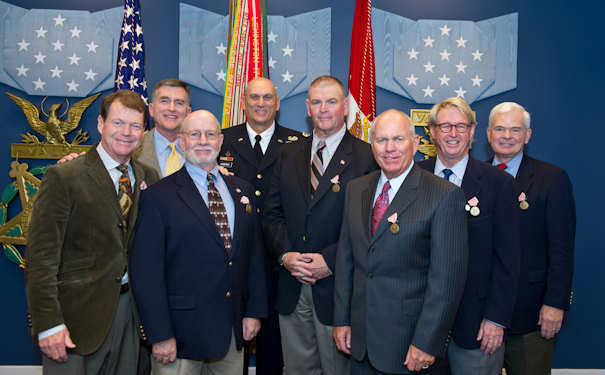 Seven men representing two organizations -- the Troops First Foundation and the Patriot Foundation -- were recognized for their work by Chief of Staff of the Army Gen. Raymond T. Odierno. "Those who are here today represent those who spend their own time and effort in order to help and assist our families, and I just wanted to have them here today to thank them," Odierno said. The recognition is something Odierno said he wants to start doing regularly, every six months, to "recognize individuals who I think have gone well beyond the call of duty to help our families and our Soldiers." Rick Kell was among the first recognized by Odierno. Kell founded the "Troops First Foundation" in 2008, along with co-founder David Feherty. Kell serves as executive director now for the organization which runs several initiatives, including one called "Operation Proper Exit," which returns wounded warriors to theater so that they can meet with Soldiers and finally leave "under their own terms." "This is a groundbreaking program, trying to bring those who have been injured in combat back to where they were injured, to bring about sometimes closure for them, but also to help them face some of the challenges that they continue to face since they were injured," Odierno said of Operation Proper Exit. The general said he has been on the receiving end of some of those visits, and said wounded Soldiers who come back to theater to visit affect the Soldiers now there. "What it really did was motivate us who were over there, and made us feel good about watching them come back to where they were injured," Odierno said. "This time they got to leave on their own terms, not on somebody else's terms. I think the young men who have gone through that have really in some cases been able to start anew." Kell credited Odierno for making Proper Exit possible. "Please note that Operation Proper Exit exists because of one person. The fact that it became a reality was General Odierno," Kell said. "I still keep the email that you sent back to me when I asked for some help. You said it would be a tremendous opportunity not only for the warriors returning but for the Soldiers and Marines on the ground, and I watched that happen, and it was amazing." Kell's foundation sponsors other initiatives as well, including "Operation Front Door," which helps veterans purchase a home through fund matching; "Operation Coaches and Warriors," which provides wounded warriors with a personal message of support and thanks from his or her favorite college basketball coach; and "Harmon's Heroes," which provides wounded warriors the chance to play golf as a form of therapy. Butch Harmon, a Troops First Foundation board member, serves as host for the "Harmon's Heroes" initiative. He was also honored by Odierno. "What a lot of people don't know about Butch Harmon, is that he's a Vietnam veteran -- two tours in Vietnam," Odierno said. "And I know how important it is to him to reach out to our veterans, and to reach out to those who have been wounded. And it was important for him to understand and help them as they came back. He started Harmon's Heroes -- working with Rick Kell -- which allows wounded warriors to experience the best facilities and staff the sport of golf has to offer." In the "Harmon's Heroes" initiative, wounded warriors travel to Las Vegas to meet with PGA and LPGA tour members. Harmon has also visited Iraq, Odierno said, and "really dedicated himself, he's always available for other tournaments that have been done, and is always there to give clinics for our wounded warriors. And I can't thank him enough for opening up his school to our wounded warriors. The feedback I've gotten has just been tremendous on that." Odierno also recognized another participant in the Troops First Foundation, Tom Watson, winner of 39 professional golf tournaments. Watson made two trips to Iraq during the Thanksgiving holiday, one in 2007 and another in 2009. "He also has participated frequently in the Troops First Foundation in their annual golf and hunting events that they do for wounded warriors," Odierno said. "And he has given a lot of his time. He can find a lot of different ways to give of his time -- and he has chosen to give back to wounded warriors." Watson works with Troops First Foundation by helping wounded warriors learn golf as a way to deal with their injuries. "I've done some work with the wounded warriors trying to teach them a little about the game of golf once they lost some limbs -- trying to teach them how to get some enjoyment out of the game after losing a limb," Watson said. "That is sometimes a challenge, but the passion these people have for the game sometimes is beyond the pale." The Patriot Foundation, founded in 2003 by Spike Smith, began by supporting families of Soldiers in the Fort Bragg, N.C., community. "He's been a strong supporter of our Soldiers and their families in the Fort Bragg area," said Odierno of Smith. "He's also an avid golfer. He started the Patriot Foundation initially as a charity golf tournament for the troops in the Fort Bragg area." The scope of that foundation has grown now, Odierno said, and now includes a scholarship for children of fallen Soldiers, and a childcare benefit to help spouses of personnel killed in action get additional education. "We concentrate on ways to help the families at Fort Bragg, since we live in the Fort Bragg area -- and they are the tip of the spear in this fight," Smith said. "There is so much need over there. And as the years have progressed, starting in 2003, we found one organization after another to give this money to, to help alleviate some of their anxiety and some of their pain." The Patriot Foundation has helped more than 600 children of Soldiers with scholarship support and more than $1.5 million has been raised since the Patriot Foundation's founding. In 2010, the Patriot Foundation provided $325,000 in scholarships for about 134 children. In 2011, that amount was $500,000 in scholarships for approximately 200 children. "Thank you for everything you have done for the great Soldiers of Fort Bragg," Odierno said. Odierno also thanked the current president of the Patriot Foundation, Chuck Deleot. Deleot is a retired Navy captain, and Odierno said what he cares about is "taking care of our men and women who have sacrificed and raised their hand to support our country." Odierno said Deleot led the Patriot Foundation in developing corporate partnerships in the Fort Bragg area to provide additional support to Soldiers and families. One such partnership, with Hardee's restaurants, for instance, has raised nearly $95,000. "Chuck, I want to thank you for everything you continue to do to move the Patriot Foundation forward," Odierno said. Deleot said the Patriot Foundation has expanded its mission. Recently, he said, the organization gave $125,000 to 25 children of Navy SEALs killed in a helicopter crash in Afghanistan. Those SEALs were part of SEAL Team Six, the same group that captured Osama Bin Laden. "We are starting a relationship with the Navy SEAL foundation," Deleot said. "And we are also working with Fort Campbell, with the judge advocate general there, to identify children of KIAs, because I have money I can give to them for scholarships now." Deleot also said an important part of the Patriot Foundation mission is helping military widows with childcare for their children, so they can get their own education. "That's the hurdle," he said. "Most of these people can get assistance to go to school, but the childcare is so expensive, they can't go." Odierno also thanked Patriot Foundation board member Mike Girimont for his work helping Soldiers. "Mike has committed his own personal time, talent, and treasure to ensure the Patriot Foundation is able to support our Soldiers and families," Odierno said. "Mike's passion for caring for our Soldiers truly sets the example for others." Girimont has gone as far as arranging for the donation of 30 cases of water a month to the Fort Bragg Warrior Transition Battalion, putting the water in his pickup and delivering it to the WTB personally, Odierno said. His involvement in the Patriot Foundation has "directly helped hundreds of our families," Odierno said. "His unwavering support demonstrates that our nation's citizens care deeply for the welfare of our troops and their families." Finally, Odierno extended thanks to retired Gen. William F. "Buck" Kernan, who serves as an advisor to the Patriot Foundation. Odierno said Kernan "has dedicated his life to the Army and service to our nation." Kernan began as a rifle platoon leader and ended as commander of Joint Forces Command, Odierno said, and "continues his service through the Patriot Foundation and helps ensure that those that sacrifice so much in defense of our nation are not forgotten." Odierno said Kernan is involved in the National Golf 9/12 effort, which is a simultaneously played multi-course golf tournament "aimed at uniting our nation through the opportunity to reflect on the shared spirit of unity that was felt on Sept. 12, 2001." "I know that you do this because of your care and longstanding relationship with Solders, but I just want to thank you for your continued support and commitment," Odierno said. Each man recognized walked away with a plaque from the Army that commemorated their service to Soldiers. Each one was also presented the Outstanding Civilian Service Medal. Rick Kell, founder of the Troops First Foundation, along with Sgt. 1st Class Joshua Olson, who was injured in Iraq in 2003 and participated in Proper Exit 2, also presented Odierno with a flag for his support of Proper Exit and his advocacy of Soldiers.